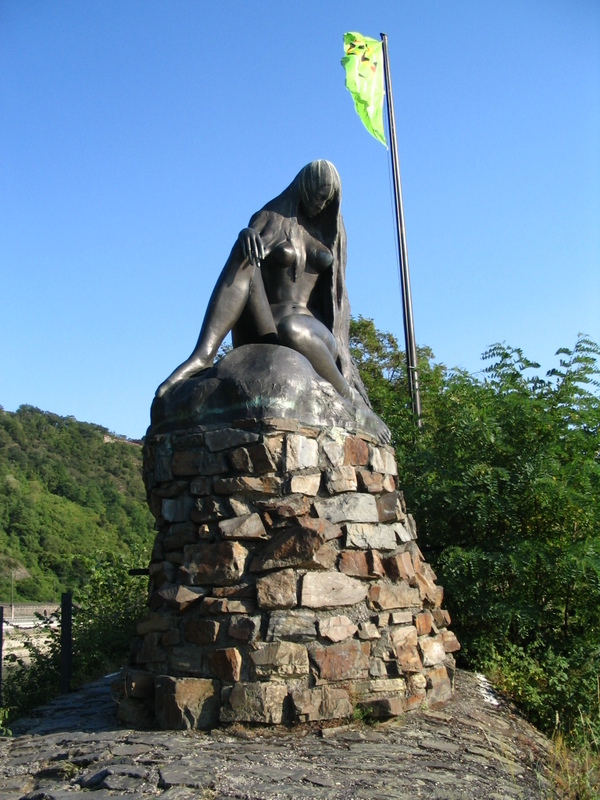 The Lorelei statue. Photo © by Marcus Scholz. Technically Lorelei is probably a water-sprite or a siren more than a mermaid, but the distinctions are somewhat blurry, so I decided to include her here on Mermaids of Earth. There are a number of Lorelei legends, but in essence it has to do with the dangers of the river in this location, and the murmur made by the river as it sweeps around the 400′ high Lorelei rock formation (in the left background in the photo above). This is one of the narrowest parts of the Rhine river, and the very strong currents and underground rocks in this section of the river have caused many maritime accidents. The name Lorelei comes from Old German and Celtic, and means ‘murmuring rock’. In German literature this gave rise to stories of Lore Lay, a beautiful maiden betrayed by her sweetheart. Lore Lay falls – or jumps – off the Lorelei Rock. It is said her voice can still be heard in the murmurs of the river and the rock, and that Lore Lay at times distracts sailors with her voice and her beauty, causing them to have accidents. The basic story is extremely well known in Germany, and has inspired and become part of ballads, poems, music and songs, as well as operas. And of course there is the Lorelei statue shown here, as well as the Lorelei Fountain in The Bronx, New York. The german poem Die Lorelei by Heinrich Heine is very well known. And there is a wonderful translation of it by A.Z. Foreman. 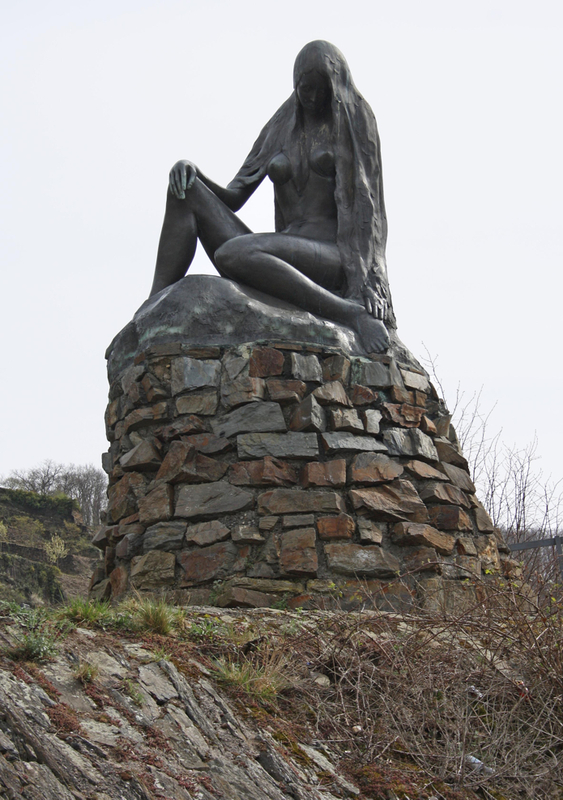 The 16′ Lorelei statue was created in bronze by Natascha Alexandrova in 1983, and has become a tourist attraction itself. The setting is fabulous – the Rhine Valley containing this section of the river – and the Lorelei rock and statue – has exceptional environmental beauty, and has been an immensely popular vacation and tourist location for a very long time. 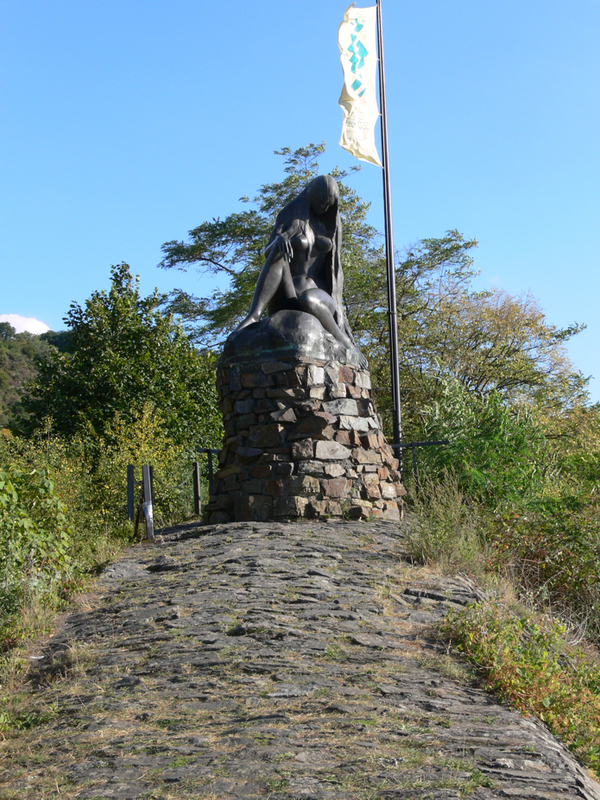 The Lorelei Statue. Photo © by Rami Grossfeld. The Lorelei Statue. Photo © by Bruce Greig. More data is needed on this mermaid sculpture and in particular the artist Natascha Alexandrova Princess Jusopov.. If you have relevant information, please contact us.